The excited text blinked on my phone, and I didn’t even have to wonder who it came from — master bander and licensed eagle bander, Dan Niven. A few exchanges later, I discovered he was out hawk watching, and what was coming next would be a flurry of plans to get Main Blind opened as soon as possible for our late summer/early fall banding season. In a few days, we were out mowing the field and inspecting our equipment in preparation for an on-time start, and perhaps a slightly early one. 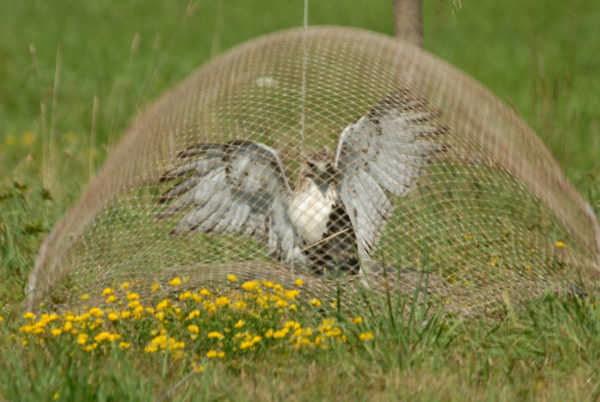 Traditionally, Main Blind opens on August 1 for what is called “Red-tailed Hawk natal dispersal” — a period of time when young Red-tails, some just weeks from fledging, are taking to the skies in number after their parents have stopped hunting for them. While some will stay near where they were born, most Red-tailed Hawks scatter, or disperse, sometimes hundreds or thousands of miles, creating a kind of false northern migration as they are carried on warm summer southwest winds up to the lakeshore. Braddock Bay bands the vast majority of its Red-tailed Hawks, mostly these hatch-year birds, during the months of August and September. This spectacle is not as well advertised as our famous spring migration. People hawkwatch, but we do not have a hired counter like we do in spring. But late summer is every bit as dramatic as spring — and on some of the days, particularly in the middle of August, downright jaw-dropping. We have had days with “every base loaded” (a Red-tailed hawk caught in every trap in the field) and a couple dozen more circling in the skies above us. It’s a truly awe inspiring sight. Red-tailed Hawk being captured for banding. Juvenile Red-tails do not have their famous red tail feathers yet — they will not get these until their third year of life. But the other notable field marks are usually present, including the belly band and the dark patagial markings. These youngsters are inexperienced hunters and are comparatively easy to trap as compared to their more experienced, wily elders (we catch far, far more juveniles than adults), which makes them very interesting to watch as they come into our station. If you are lucky and our licensed eagle bander is working that day, you might even see a magnificent hatch-year Bald Eagle up close. Many novices to birding do not realize that Bald Eagles do not have their iconic white heads until they are much older. At about 3 1/2 to four years of age, the white head feathers become most visible, although they progressively lighten up through the previous years. Hatch-year eagles are nearly entirely brown, but every bit as large, strong, and impressive as their older counterparts. 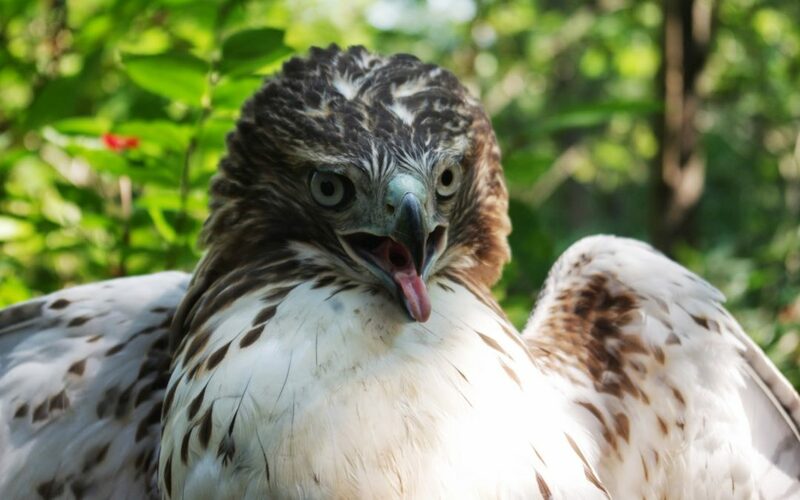 This fall, Braddock Bay Raptor Research will be announcing when banders will be at our Main station through our Twitter feed, @BraddckBayHawks. Updates will appear either the evening before or the morning of banding; since weather and wind direction can be so variable, we sometimes do not know until the morning of a banding day whether we are going to have good conditions. If response is good, we will continue this practice for our spring season in 2017. Just wear bug spray, and a lot of it. The mosquitoes are not as bad as they were last year, but the biting flies are out in force. It appears your Twitter handle is actually @braddckbayhawks (no “o”). You are correct, Bridget! Thanks for catching the typo!